Born on October 24, 1949, in the village Lama of the Dudin district of the Krasnoyarsk region (Southern Siberia). In 1971 he completed studies at the Gnessins’ Music College, where he majored in clarinet. 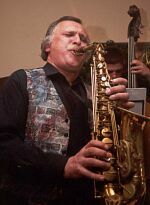 In 1976 he completed saxophone studies at the Gnessins’ State Musical Pedagogical Institute, becoming the first recipient of a diploma of a saxophone major in the Soviet Union. He is a winner of the All-Union Competition of Performers on Woodwind Instruments in Minsk in 1979 and of the International Youth and Students’ Festival in Havana (Cuba) in 1978. He is the author of the book “The School of Jazz Improvisation on the Saxophone” (published by “Kifara” publications, 1997). Mr. Oseichuk has been an active participant in the jazz scene for over 30 years. For 18 years he has been the leading soloist in Igor Bril’s jazz ensemble. 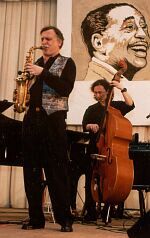 He participated in numerous international jazz festivals, including those in Belgrade in 1975 and 1985, Leipzig in 1985, Sofia in 1986, Prague in 1986, “Jazz on the North Sea” (Netherlands) in 1988, Jakarta (Indonesia) in 1988, and has toured numerous countries, among them Denmark, Germany, USA, Bulgaria, Yugoslavia, and many Russian cities, among them Krasnoyarsk, Kursk, St. Petersburg, Ufa, Yaroslavl, Samara, Volgograd, Surgut, Tomsk, Norilsk, Nizhni-Novgorod, Arkhangelsk etc. 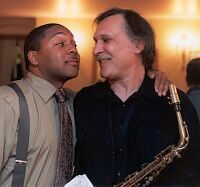 He has played with such world jazz celebrities as Joe Henderson, Bobby Hatcherson, Jerry Dajen, Mel Lewis, Marshal Kays, Michael Brecker and others. Since 1989 he has been the director of the jazz music ensemble “Green Wave”. The ensemble’s creed is promoting the performing talents of young jazz musicians. 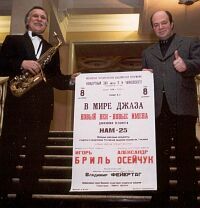 At various times the ensemble featured such musicians as: trumpet player Alexander Sipyagin (currently a soloist in the Mingus Big Band, New York); bass-guitarists and double bassists Boris Kozlov (currently a soloist in the Mingus Big Band, New York), Arkady Ovrutsky, Igor Ulanov, Yevgeny Kalistratov, Oleg Sokolov, Dmitri Li and Sergei Vasiliev; pianists Yevgeny Pechnikov, Vsevolod Timofeyev, Tigran Grigoryan and Konstantin Gorbatenko; percussionists Feodor Andreyev, Vladimir Kuleshov, Piotr Talalay and Pavel Timofeyev, and electric-guitarist Konstantin Serov. “Green Wave” has participated in various international festivals, among them: “Corpus Christi” (USA) in 1990, Pori Jazz (Finland) in 1992, “Minsk-1994” in Belarus, “Birstonas” (Lithuania) in 1996, “Jazz Near the Ocean” (Vladivostok) in 1993, in Moscow in 1998 and 1999, the “Jazz Province” festival in 1997, 1998, 1999 and 2000, the International Jazz Festival in the “Hermitage” Garden (Moscow) in 2001, “Mini Jazz Forum” in Berdyansk, Ukraine in 2001, the Jazz Festival in Memory of Willis Conover in Moscow in 2001 and also participated in jazz festivals such as “Jazz Handshake” (Volgograd) in 1994, “International Jazz Meetings” in Arkhangelsk in 1996, “Orenburg – 1996”, “Ufa – 2000” and others. 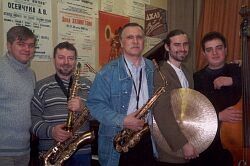 Alexander Oseichuk is one of the founders of jazz education in Russia. 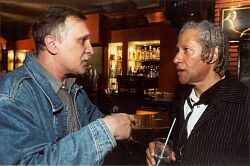 Since 1974, with the emergence of jazz departments in many music colleges in the USSR, he worked in the Gnessins’ State Musical College, and since 1984 he is on the faculty of the Gnessins’ Russian Musical Academy, teaching saxophone majors, jazz ensemble and the basics of jazz improvisation. In 1997 he was awarded the honorary title of a Professor. The students of Professor A.V.Oseichuk include of the All-Russian and International jazz competitions: Alexander Bril, Dmitri Bril, Alexei Kruglov and Anton Rumyantsev, winners of All-Russian competitions for jazz performers: Nicolai Belan, Zhanna Ilmer, Evgeny Pechnikov, Leonid Shupik, Anton Zaletayev, Evgeny Sokolovsky, Denis Shvytov, Dmitri Kondrashov, Oleg Grymov, Anton Zaitsev, as well as well-known performers such as Sergei Gurbeloshvili, Nicolai Abramov, Nicolai Vintskevich, Pavel Grigoriev, Nicolai Moiseyenko and others. 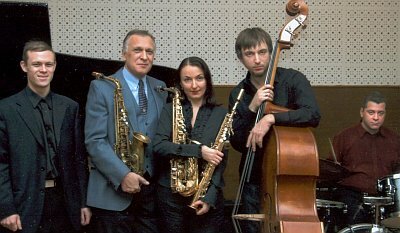 Green Wave 2006: Rodion Goborov - piano; Alexander Oseichuk - alto sax; Jeanne Ilmer - soprano & alto saxes; Andrei Aminov - bass; Vladimir Kuleshov - drums. Alexander Oseichuk, alto-saxophone, Natalia Rozova - piano (1,7 - 11,15,16), Olga Sulimova - piano (4 - 6, 12 - 14), Daniil Kramer - piano (17,18). Alexander Oseichuk, alto-saxophone (N.1,2,4,5,6,8,9); Evgeny Pechnikov, piano (N.1,2,3,6,7,9); Sergei Vasiliev, double-bass (N.1,2,3,6,7,9); Pavel Timofeyev, percussion instruments (N.1,2,3,6,7,9); Tigran Grigoryan, piano (N.4,5,8); Dmitri Li, double-bass (N.4,5,8); Piotr Talalay, percussion instruments (N.4,5,8). Alexander Oseichuk, alto-saxophone; Vsevolod Timofeyev, piano, arrangement of a string quartet (N.3), arrangement (N.7). Dmitri Li, double-bass; Piotr Talalay, percussion instruments. String Quartet (N.3) comprised of: L.Leunova, 1st violin; M.Suslova, 2nd violin; M.Leschiskaya, viola; N.Volkova, cello. 8. Creole Love Song (D.Ellington) -5.37. 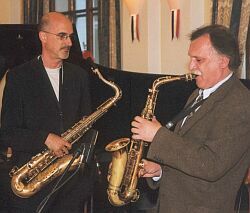 Alexander Oseichuk, alto-saxophone; Vsevolod Timofeyev, piano, arrangements (N.2-7); Oleg Sokolov, double-bass; Vladimir Kuleshov, percussion instruments. 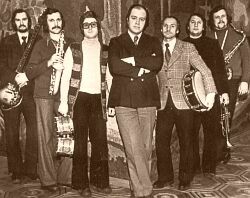 Alexander Oseichuk, alto-saxophone; Alexander Sipyagin, trumpet (N.4, 9); Evgeny Pechnikov, piano (N.1,2,3,4,8,9); Vsevolod Timofeyev, piano and keyboard instruments (N.5,6,7,10); Boris Kozlov, double-bass and electric bass (N.1,3,4,9); Igor Ulanov, double-bass (N.2, 8); Feodor Andreyev, percussion instruments (N.1,2,3,4,8,9). 10. A Lot is Just What is Needed (G.Dial) - 3.41. 1. “The Street without End”, from the LP record “The Morning of the Earth” Igor Bril’s Jazz Ensemble (“Melodiya” 33 С 60 - 11295 - 6) 1977г. 2. “Alto Mood” from the LP record “The Orchestra Arrived”, Igor Bril’s Jazz Ensemble (“Melodiya” С 60 - 14065 - 66) 1980. 3. “Singing Trees”, published in the edition: 4. “Paraphrase of Themes of George Gershwin” for saxophone quartet, published in the edition: “Popular Music Orchestras and Ensembles” Volume 2, “Muzyka” Press, 1984. 4. “Paraphrase of Themes of George Gershwin” for saxophone quartet, published in the edition: “Popular Music Orchestras and Ensembles” Volume 4, “Muzyka” Press, 1986. 5. “Ballad” recorded on the CD “Episode N.7”, Alexander Oseichuk and the “Green wave” jazz music ensemble (“Sound and Vision” SVCD 97009), 1996. 7. “Behemoth” recorded on the CD “Dedication”, Alexander Oseichuk and the “Green wave” jazz music ensemble (“Boheme Music” CDBMR 811028), 1999. 8. “Forgive us, Duke” is recorded on the CD “Forgive us, Duke”, Alexander Oseichuk and the “Green Wave” jazz music ensemble, (“Mystery of Sound” MZJAZZ -001 - 2), 2001. 9. “Blacks Begin… and Win” is recorded on the CD “Fat Cat Waltz”, Alexander Oseichuk and the “Green Wave” jazz music ensemble, ("J.R.C", JRC 01182 - 2), 2001.